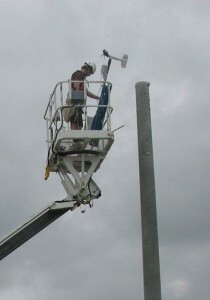 With two decades of experience installing and maintaining coastal weather stations, our field engineers know how to prepare a station for the elements. Everything they use – the sensors themselves, mounting hardware, weatherproofing, and cabling is designed for maximum durability and to keep high quality data coming in to the network. Everything from protecting the electronics from salt corrosion and lightning spikes to knowing how to keep birds off the station all pay big dividends in keeping a station online and minimizing the need for unplanned maintenance. To ensure maximum up time and reliability, we monitor the health of our stations and conduct periodic preventive maintenance to head off problems before they occur.